Metathesis Portal. First reported in 1955 by Anderson et al. using a Ti(II) catalyst, for the polymerization of norbornene,1 the metathesis reaction gained interests	and popularity over the last decade. 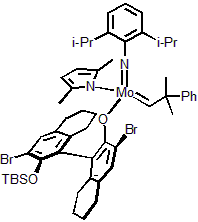 Further investigations in the mechanism of the transformation by Chauvin sparked the development of novel more well-defined metathesis catalysts.2 Independently, Grubbs and Schrock reported novel functional-group tolerant catalysts.3,4 This breakthrough in olefin metathesis was rewarded in 2005 by a Nobel Prize to Chauvin, Grubbs, and Schrock for their contributions. The development of this technology over the years, brought to the forefront the use of Molybdenum, Ruthenium, and Tungsten as metals for metathesis. To remedy the air sensitivity of the Schrock systems, XiMo developed a new process to encapsulate various Molybdenum based catalyst in microcrystalline wax. This wax protects the catalyst from air and allow the setup of reactions for metathesis with less drastic conditions. 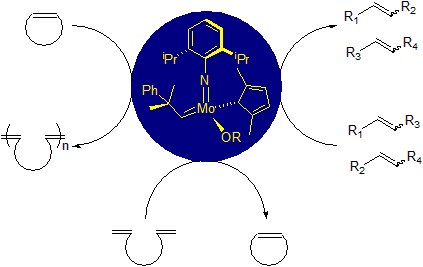 As a proof of concept, the team of researchers at XiMo ran several cross metathesis and ring closing metathesis reactions using basic schlenk techniques. 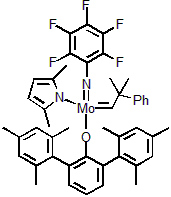 The first 2 catalysts offered are XiMoPac-Mo001 and XiMoPac-Mo003, two Molybdenum based aryl-oxide catalysts. 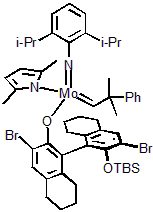 XiMoPac-Mo001 has showed great results in cross metathesis and ring closing metathesis and XiMoPac-Mo003 is an efficient catalyst for enantioselective alkene metathesis. 1 Anderson, A. W. et al. Chem. Abstr. 1955, 50, 3008. 2 Chauvin, Y. Makromol. Chem. 1970, 141, 161. 3 (a) Schrock, R. R.; Murdzek, J. S.; Bazan, G. C.; Robbins, J.; DiMare, M.; O’Regan, M. J. Am. Chem. Soc. 1990, 112, 3875. (b) Bazan, G. C.; Khosravi, E.; Schrock, R. R.; Feast, W. J.; Gibson, V.C. ; O’Regan, M. B.; Thomas, J.K.; Davis, W. M. J. Am. Chem. Soc. 1990, 112, 8378. (c) Bazan, G. C.; Oskam, J. H.; Cho, H.-N.; Park, L. Y.; Schrock, R. R. J. Am. Chem. Soc. 1991, 113, 6899. Nicewicz, D. A. et al. Science 2008, 322, 77. 4 (a) Schuster, M.; Blechert, S. Angew. Chem., Int. Ed. Engl. 1997, 37, 2036. (b) Armstrong, S. K. J. Chem. Soc., Perkin Trans.1 1998, 371. (c) Grubbs, R. H.; Chang, S. Tetrahedron 1998, 54, 4413. (d) Grubbs, R. H.; Miller, S. J.; Fu, G. C. Acc. Chem. Res. 1995, 28, 446. (e) Narayanam, J. M. R. et al. J. Am. Chem. Soc. 2009, 131, 8756. XiMo Experimental Note – Please READ before FIRST USE!